Collecting important information about each player is critical to get your season off on the right foot. But what questions should you include? How can you collect everything you need while still making the process easy and quick for participants? What are the best strategies to make your player information easy to sort? Reference our youth sports registration form template below to get your season off to a smooth start. If you’re like most youth sports organizations and parents register and pay for their children, make sure your form requires that Player and Parent information is collected at the beginning, along with the participant’s Date of Birth. You should also separate “First Name” and “Last Name” in your form so you can sort participants alphabetically easily after registration. Birth Date questions should be separated by month, day, and year so that you get clean and accurate information from participants. For example, you don’t want to have hundreds of birthdates in different formats like 12/26/2010, 12/26/10, or December 26th, 2010. If your form is set up with drop down menus the players will be much easier to view and sort when registration is over. If you’re using Jersey Watch to collect registration and online payments, these questions are added by default so you don’t have to worry about them. Next make sure you collect accurate contact information for the player or parent, depending on who your main contact will be during the season. Be sure to collect 10-digit phone numbers and accurate email addresses (so you can send messages once the season starts). If your form doesn’t require area codes or valid emails, you could wind up with useless contact information for parents. Jersey Watch will automatically require valid phone numbers and emails so you don’t get any inaccurate information, and contact information is automatically stored and sorted for you so you can send messages during the season. It’s generally not a good idea to ask questions like “Mother’s Name” or “Father’s Phone Number”. Instead, just require that each participant include at least one name, email address, and phone number, and all additional contact information can be optional. Next, your form should include questions that are unique to your sport or age group. Any uniform sizes or t-shirt options should be included at the beginning of your form. All of these questions should be dropdown questions in your online form so that you get clean and accurate data that can be sorted once all of your players register. 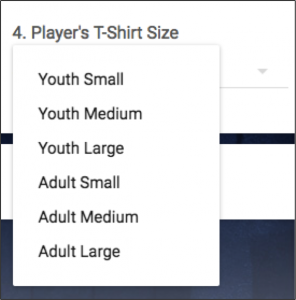 You don’t want a bunch of people asking you for Adult XL t-shirts if you don’t have that size available. Use a dropdown question so you get clean information from each participant. Also be sure to include a question that lists volunteering options for parents. Many parents are ready and willing to help coach, setup facilities, work concessions, and more. These questions can be checkbox questions in your form so they can select multiple options that they’re interested in. 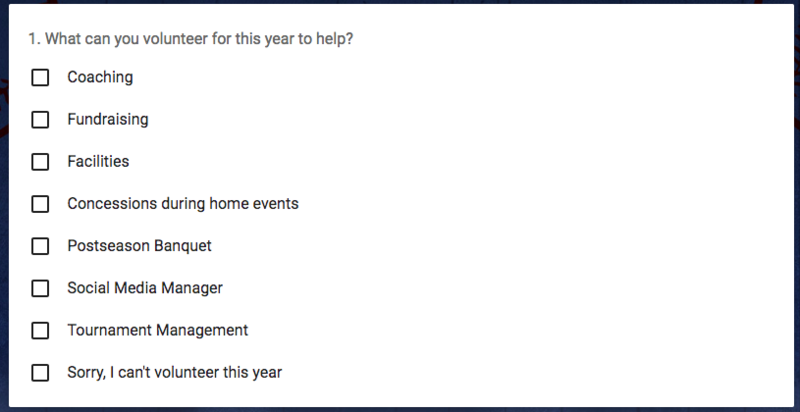 If you don’t require that parents volunteer, include an option like “Sorry, I can’t volunteer this year” in the list of options. Getting parents involved during the registration process can save you a ton of work recruiting volunteers during the season. Waivers, codes of conduct, and parent policies can also be included at the end of your form. Don’t forget to include clear cut expectations for parent and player behavior during the season and list the penalties for any violations. Nobody wants to deal with unruly parents! Finding sponsors for your team or league can be tough. An easy opportunity is to ask parents if they want to become a sponsor at the end of the registration process. Just ask a quick question at the end and allow parents to pay an extra amount to sponsor a team this year. You can also collect the names of parents who might be interested, and follow up with them directly via email about sponsorship opportunities. Recruiting new coaches or referees is also a challenge. If you’re grinding to find enough volunteers for this season or need high school students to help as assistant coaches, include a quick question at the end for parents to help you find help! Overthinking the pricing. Keep it simple when it comes to youth sports. If you’re a volunteer don’t create more work for yourself than necessary. Complicated pricing creates more questions, special requests, and complaints you’ll have to answer from parents. If you’re thinking of using different pricing tiers for age groups, and offering a variety of discounts for this and that you should reconsider. Instead, keep prices roughly the same regardless of the player’s age and save your self a ton of time. Using text box questions for every question. If a question has a limited amount of potential answers (like T-Shirt Size, or Player’s Grade) always use a dropdown question that includes only the possible answers. Parents are in a hurry, and they’ll give you bad information if you give them a blank box to type into. Making participants answer too many questions. Too often we see organizations requiring that parents answer dozens of questions during the registration process. Do you really need to know contact information for 5 different people? Or the player’s favorite color? 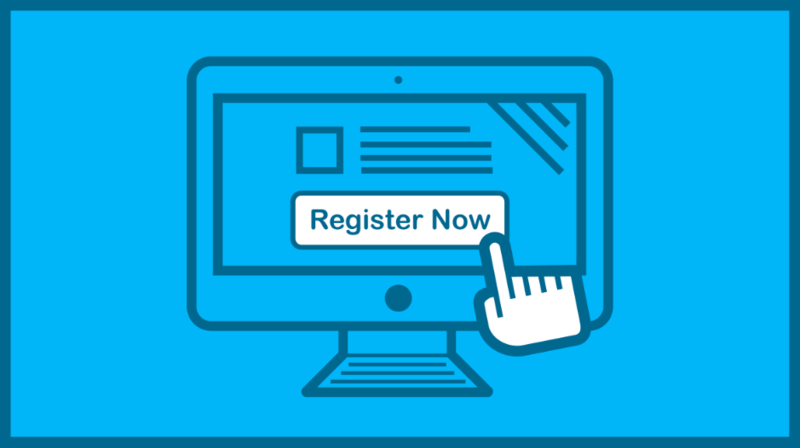 Reduce your form down to the essential questions so that it’s easy for people to register. Looking for other ideas to simplify your registration process? Check out this blog post: 5 ways to simplify registration for your sports organization. Doing things the way they’ve always done it. Parents expect things to be easy and to be able to register and pay from their phone at their convenience. Don’t make them drive and write checks to register. If you choose to do things the way you’ve always done it, you’ll find participation rates slowly decreasing as they find more convenient activities to participate in. The good news is it’s easier than ever to handle everything online! Keep these things in mind when you set up your registration form and you’ll be off and running toward a successful season. In future seasons, you can duplicate the same registration form and make tweaks or improvements as you go.